After weeks of unseasonably warm weather, our luck finally came to an end on the first day of spring. Yesterday's conditions were brisk but comfortable, but we woke up to a temperature that felt like 24° today. Although it was the first day of the vernal Equinox, I went to Equinox's competitor: Life Time Athletic in Syosset. 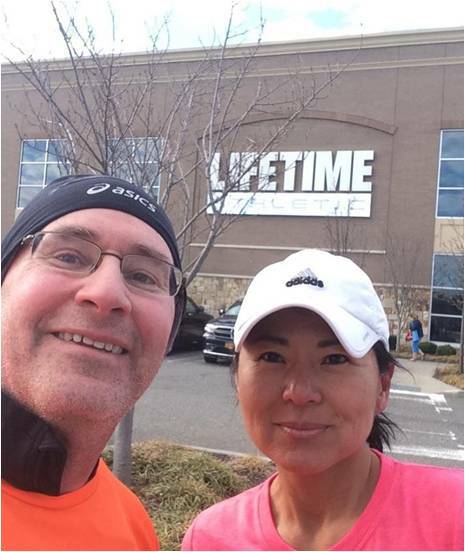 I was there for the Life Time group run led by the one and only SIOR. I met SIOR in the lobby of the Life Time Athletic building. This is not to be confused with the Time Life building where I spent most of my career. Life Time is huge and opulent and and there were lots of people streaming in at 8:00 AM. As I mentioned, it was freezing outside and apparently everyone preferred to run on treadmills rather than join me and SIOR on the road. They missed out, because group running is fun and it makes long distances seem a lot shorter. At least that was the case for me today. SIOR and I took off at 8:15 AM and tucked into an adjacent neighborhood that had long, straight and wide roads. SIOR's phone app wasn't telling her which roads to follow so we used our sharply honed innate navigation that pretty much kept us on the same two loops. We did branch off onto another loop for our last two miles. We'd both dressed for cold but it was really chilly. I managed to warm up about two thirds through, SIOR not so much. I loved the run and the opportunity to chat which made six miles feel like I was only running three. I'll admit that I ran extremely slowly, as I do these days, but my run coach didn't complain about the slow pace bothering her knees. She did one-step me most of the run and I was really hoping that would produce a faster pace on my part. Nope. Closer to the end, SIOR picked up her pace but she never went so far ahead that she was out of sight. We'd intended to run five miles but ended up covering six. If other people were brave enough to leave the temperature-controlled fitness club, they would have had their choice of 5, 10 or 15 mile distances. The group run is open to anyone, and you don't have to be a Life Time member to participate. I really hope more people show up next time because it's a good workout and you can learn technique from a certified running coach. After our run, SIOR and I headed over to a Starbucks on Jericho Turnpike, a new location for a Runsketeer après-run coffee break. I am really glad to have covered six miles today. It was fun and I felt good. I probably could have - and should have - pushed a little harder. Warmer spring weather should bring more participants to SIOR's group runs. I think the weekend group events will be posted on the Syosset Life Time Facebook page with time details. Tell your friends! Some of your best writing always coincides with runs with this, how you say, SIOR. Fun and much appreciated the company and loyal support. A true friend 'til the end. The Runsketeers are like the Marines. We have each other's backs, run on freezing cold days and then have coffee. By the way, that's pretty much everything I know about the Marines. I had lots of fun today too. We need to plan our April run.